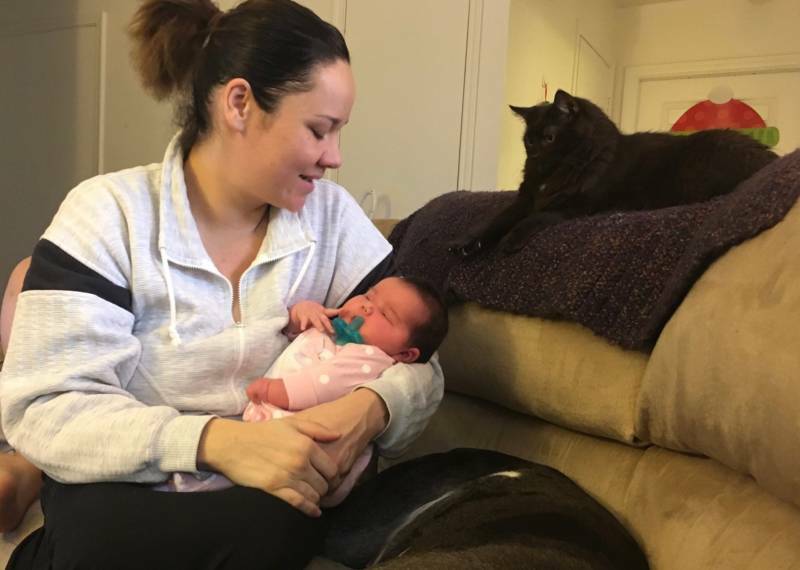 On the morning of Nov. 8, 2018, with flames and smoke darkening the sky above Paradise, a very pregnant Melissa Johnson packed her whole family into two cars and fled down the hill. "At the time, it was my daughter who's 14 and my son who’s 11. 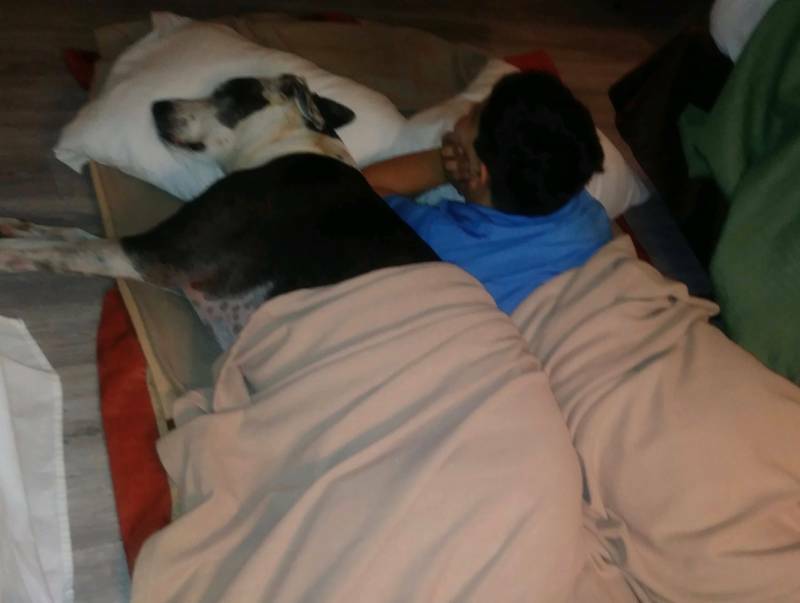 My father-in-law, he’s disabled, and so is my husband. He’s disabled as well. We had three dogs and a cat and a rabbit." They managed to get out, as did three other households in her extended family. In total, 14 people, 11 dogs, five cats, two birds and the rabbit gathered at her sister’s one-bedroom apartment in Chico. "That night, we knew we couldn’t stay there. It was too crowded," said a remarkably optimistic Johnson. Fortunately, Johnson made it out of Paradise with her cellphone and her bank card, so she started calling hotels. But she was one of tens of thousands of desperate people doing the same thing at the same time. The Camp Fire displaced roughly 50,000 people. She finally found two hotel rooms way up north, in Redding. In less than a week, Johnson spent $1,000 on hotel rooms before somebody told her about Airbnb’s Open Homes program, which pairs hosts with disaster survivors and relief workers in need of free temporary housing. Airbnb waives its fees, as part of the program, and the hosts do, too. 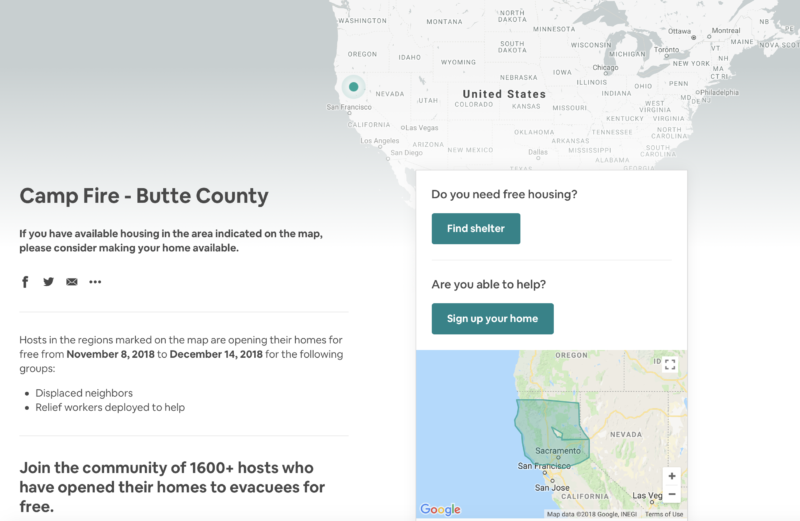 Kellie Bentz, chief of the company’s Global Disaster Response & Relief, calls Open Homes “surge capacity,” adding that it "hits a sweet spot, creating a bit of comfort in a really tough time." Cinde Dolphin is originally from Southern California, where her block once survived a fire unscathed. Dolphin said the experience sensitized her to the plight of those escaping the Camp Fire. "It was just gut-wrenching," Dolphin said. "It just seemed as though there was very little help for those in Paradise." Dolphin signed up her spare mother-in-law studio apartment on Airbnb, and within an hour received a query from Melissa Johnson. "I was a bit skeptical that they would be comfortable in my house," Dolphin said. "But [Johnson] said, 'Anything is better than where we are right now.'" It was enough to get Johnson through until she found a two-bedroom apartment in Carmichael, east of Sacramento. She figures they'll stay there for at least the next six months, given how long the cleanup and rebuilding effort in Paradise is likely to take. 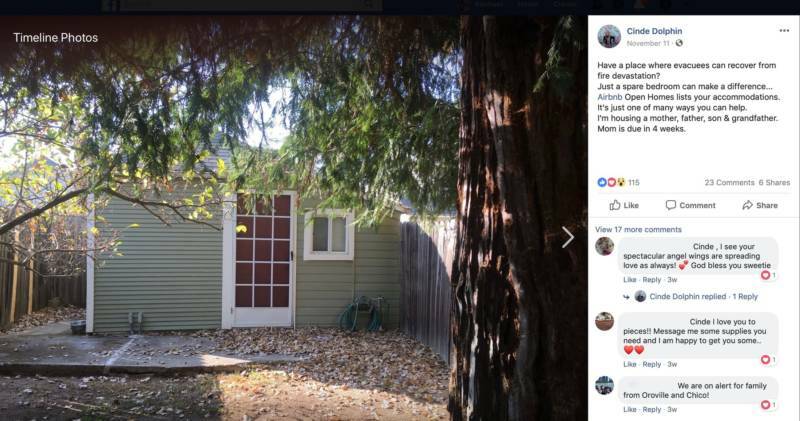 Johnson is a professional caregiver, and near Sacramento, she's in a better position to look for new clients, after she lost a primary one who relocated three hours away after the Camp Fire. In the meantime, everything they have is donated, including a baby shower's worth of gifts for little Annette Marie, born 10 days after the Camp Fire started, at a robust 11 pounds 2 ounces. Dolphin posted about Johnson’s family on Facebook, and her social circle responded with everything from a playpen for the baby to a Christmas tree. Melissa, Annette, Trevor, Jerry, Kalea, William, the Great Danes Lilly and Penelope, the toy poodle Callie, the cat Damon Chewy, and the rabbit, JJ, will all celebrate Christmas here while they negotiate with their insurance company. Johnson plans to rebuild the Paradise home they moved into one week before the Camp Fire struck. "We still own it … what’s left of it. It was beautiful, surrounded by trees. Dogs ran and played all day long," Johnson said. It's fair to say Johnson's family relies on her strength and generosity every day, but she said she’s been overwhelmed by the generosity she’s received from people who were strangers before the Camp Fire. "It’s been overwhelming to see how kindhearted and supportive people have been. It just makes me realize how I want to be like that. You know? Not only in time of need, but in general." The experience had a big impact on Dolphin, too. "This experience really reinforced in my thinking that we are so blessed and fortunate to have what we have," she said. "And if we can share it with others, just give them a place to regroup and plan for the next step, it makes a huge difference."